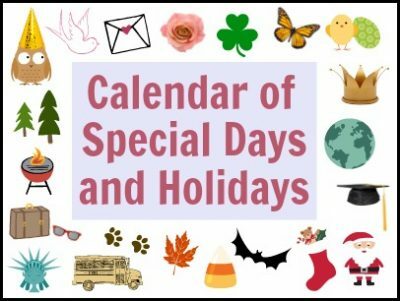 Each month there are numerous special days and holidays that we can celebrate with children, and often use as a learning tool as well. Of course, there are popular holidays such as Valentine’s Day, Christmas, and Easter. However, there are tons of fun and even silly special days such as National Carrot Day and Penguin Awareness Day. To access crafts and recipes specific to these days click on the months below. 1/1 – New Year’s Day – While New Year’s Day is always January 1st, the real festivities are the day before on New Year’s Eve! Celebrate the coming of the brand new year with some fun time capsule projects or by making your own party accessories. 1/5 – National Bird Day is on January 5th. Nature lovers, bird lovers and bird watchers across the country annually recognize National Bird Day as one of several designated holidays celebrating birds. 1/6 – Bean Day in on January 6th. This day celebrates the bean in all sizes, shapes and colors. Beans (legumes) are one of the longest cultivated plants dating back to the early seventh millennium BC! Find lots of craft projects and activities using beans. 1/15 – Hat Day is on January 15th. Celebrate this fun day by making all sorts of hat crafts! 1/18 – World Snowman Day is on January 18th. We have hundreds of snowman-related crafts and recipes for you to make. 1/19 – National Popcorn Day is every year on January 19th. The National Popcorn Board created this day to celebrate the fluffy treat we all enjoy. Check out all the fun crafts and treats that can be made from popcorn. 1/20 – Penguin Awareness Day is celebrated on January 20th to help raise awareness and bring attention to the conservation of penguins and their natural habitats. Teach kids about penguins while making fun crafts and activities. 1/21* – Martin Luther King Day is celebrated on the third Monday of January, and therefore changes each year. This special day celebrates the life achievements of the influential American civil rights leader, Dr. Martin Luther King Jr.
1/28 – International Lego Day celebrates the filing of the patent for the original LEGO brick system on January 28, 1958. 1/29 – National Puzzle Day is January 29th and encourages people of all ages to do a puzzle of any kind including word, number, board games, virtual, picture, room, video, wooden & more. Black History Month celebrates the achievements by African Americans and recognizes the important role of blacks in US history. The event grew out of an idea by historian Carter G. Woodson and is celebrated annually in February. National Cherry Month happens each year in February. Why, when most of us associate cherries with summer? Actually, it’s for that very reason! National Cherry Month reminds us to enjoy cherries in all their forms throughout the year. Our favorite way to enjoy them is with a cherry-themed craft! National Wild Bird Feeding Month was started to educate people about feeding and watching wild birds. February is an ideal time to hang homemade bird feeders for our feathered friends. 2/2 – Groundhog Day and Punxsutawney Phil are nearly synonymous. The world’s most famous groundhog has been predicting the weather in Pennsylvania each February 2nd since 1886. Make your own version of Phil and see if he sees his shadow where you live! 2/5* – Chinese New Year, also known as the Spring Festival, is celebrated by more than 20% of the world. It’s the most important holiday in China and to Chinese people all over. 2019 is the Year of the Pig. 2/9 – National Pizza Day – No one is certain when National Pizza Day was created, but we know that pizza was invented by the Romans. Today Americans eat an average of 23 pounds of pizza per person each year! 2/14 – Valentine’s Day is celebrated each year on February 14. Originally a feast for a saint, Valentine’s Day still has a religious meaning to some Christians, but it is universally known now as a celebration of romance and love. You’ll find hundreds of craft ideas here! 2/18* – Presidents Day occurs on third Monday in February. While several states still have individual holidays honoring the birthdays of George Washington, Abraham Lincoln and others, Presidents Day is widely seen as a time to celebrate all US presidents, past and present. 2/27 – International Polar Bear Day is a global attempt to draw attention to the challenges facing polar bears in a warming Arctic. Celebrate these magnificent animals by reducing your energy consumption and making a fun craft. 3/1 – National Pig Day was started in 1972 by two sisters “to accord the pig its rightful, though generally unrecognized, place as one of man’s most intellectual and domesticated animals.” Celebrate with a pig craft! 3/1 – Celebrate Peanut Butter Lover’s Day with a peanut-themed craft, a tasty snack (of peanut butter, of course!) and these fun facts: it takes around 540 peanuts to make a 12-ounce jar of peanut butter; peanut butter was first sold in the US at the St. Louis World’s Fair in 1904; and Americans spend around $800,000,000 per year on peanut butter. 3/2 – Dr. Seuss’s Birthday – Celebrate the beloved author of 46 whimsical, zany books for kids. We have dozens of project ideas inspired by Dr. Seuss stories and illustrations. 3/5* – Mardi Gras – French for Fat Tuesday, is a day of celebration and feasting before ritual fasting during the Christian season of Lent. Even if it isn’t part of your religious tradition, you can enjoy the colorful and joyful costumes, foods, and decorations of Mardi Gras. 3/17 – St. Patrick’s Day began in the 1600’s as a religious feast and has transformed into a celebration of Irish culture, including the delightful leprechauns from Irish fables. Put on your green clothes and start crafting shamrocks, leprechauns, rainbows, and that elusive pot of gold! 3/20* – The First Day of Spring falls is marked by the spring equinox, which falls on March 19, 20, or 21 each year. Welcome the season with crafts featuring flowers, kites, bunnies, chicks, eggs, and all the other symbols of new life! International Guitar Month was created in 1987 to celebrate guitars and guitar products. Craft your own guitar this month using one of our fun ideas! National Frog Month is in April. Frogs are vital to the food chain and help keep insect populations under control. Frogs live on every continent except Antarctica… and they are a great subject for crafting! National Garden Month is the perfect time to get outdoors and create something beautiful. Check out the hundreds of garden-themed craft tutorials we have. 4/1 – April Fool’s Day – Enjoy some good-natured pranks and practical jokes on April 1st. You’ll find a lot of fun and silly ideas here, particularly for food-themed tricks. 4/3 – Find-A-Rainbow Day – A rainbow is a thing of beauty, a signal of hope, and a sign of promise. The best way to be sure you’ll see a rainbow on April 3rd is to craft your own! 4/4 – International Carrot Day was established in 2003 to spread knowledge about the carrot and its health benefits around the world. Celebrate with a carrot-themed craft and an edible project, too! 4/8 – Zoo Lover’s Day – If you can’t visit the zoo on 4/8, do the next best thing and create a zoo’s worth of crafts with the kids! We have tutorials for practically every animal you can name. 4/9 – Unicorn Day celebrates the most beloved of mythical creatures, symbols of purity and enchantment, part of many fairy tales and legends. Unicorn crafts and edible treats are a must on April 9! 4/11 – National Pet Day encourages people to pay special attention to pets who may not get extra attention. Volunteer at a shelter, or just stop by to give the animals the love they deserve. 4/19* – Passover is one of the most important holidays in Judaism. Passover commemorates the Jews’ escape from slavery in Egypt. Its date is based on the Hebrew calendar and falls in either in March or April. 4/21* – Easter is a Christian holiday that celebrates the resurrection of Jesus Christ from the dead. It is a popular secular holiday as well, with many symbols and traditions (and craft projects!) inspired by spring and rebirth. 4/21 – Kindergarten Day honors German teacher Friedrich Wilhelm August Frobel, who started the first kindergarten in 1837. He recognized that children learn through play and experience, and believed Kindergarten would help ease the transition from home to school. 4/22 – Earth Day is celebrated in over 190 countries, with events demonstrating the commitment to environmental protection. This annual event was first celebrated in 1970. It’s a wonderful opportunity to talk about reducing, reusing, and recycling craft materials. 4/26 – National Pretzel Day is a great opportunity to enjoy tasty snacks and fun crafts. We have 70+ ideas for crafting with pretzels. 4/26* – Arbor Day – The first Arbor Day in the US was in 1872. It’s celebrated around the world as a day when individuals and groups are encouraged to plant trees. American Bike Month is one of the older special dates on the calendar. It was started in 1956 to showcase the benefits of bicycling and to encourage more people to giving biking a try. Flower Month – Few things say “May” as much as flowers, so it’s appropriate that we celebrate Flower Month when we do. Try one (or more!) of our hundreds of beautiful flower crafts and recipes. National Duckling Month – Baby ducks are one of the cutest things you’ll see in the month of May. Celebrate these beloved birds with a family-friendly craft. National Photo Month was first recognized by Congress in 1987 as a way to recognize photography as an artform. Not only is photography an art on its own, but photos can be used to create many other types of arts and crafts. We have dozens of ideas for you to peruse. National Strawberry Month is the perfect time for all sorts of strawberry related crafts and recipes. Did you know that strawberries have an average of 200 seeds? Or that strawberries are a member of the rose family? Or that these popular fruits are grown in all 50 states? Now you do! National Physical Fitness and Sports Month is all about promoting ways for people of all ages and body types to be physically active. Head outdoors for some play, then follow up the exercise with a sports-themed craft or recipe. International Drum Month was observed in November from 1996 until 2013, but has been in May since 2014. Regardless of the month, any time is a great time for making your own drum! Teacher Appreciation Week occurs at the beginning of May. Create a special gift or a thoughtful card for your favorite teacher. We have hundreds of ideas for you. National Pet Week, which is the second week in May, honors the benefits pets bring to people’s lives. Whether your beloved pet is furry, feathered, scaly, or something else, we have lots of project ideas for practically every animal you could name. National Transportation Week occurs during the third week of May. It recognizes the importance of transportation and the contributions of those who build, operate, and maintain it. Celebrate with a car, boat, bus, plane, or train craft. National Backyard Games Week, which falls during the last week of May, is a great time to head outdoors for family fun. Check out all of our ideas. 5/1 – May Day is a traditional spring holiday in many cultures and often features dances, singing, flowers, and cake. 5/3* – National Space Day takes place on the first Friday in May. It promotes STEM education for children and is dedicated to the achievements, benefits, and opportunities of space exploration. Try one of our many space crafts. 5/4 – National Weather Observers’ Day is for those who enjoy watching and observing the weather and provide a valuable resource as Storm Spotters. Create a craft about your favorite kind of weather! 5/4 – Star Wars Day started as pun (May the fourth be with you!) warmly shared by fans and has morphed into a full-fledged celebration of all things Star Wars. We have dozens of crafts and recipes to make the day memorable. 5/5 – Cinco De Mayo marks the anniversary of the Mexican Army’s unlikely victory over the French at the Battle of Puebla in 1862. It has become a celebration of all aspects of Mexican culture. Use our craft and recipe ideas to host a fiesta that is fabulosa! 5/7* – National Teacher Day is the perfect opportunity to thank teachers for all they do. Make a special homemade gift and add a card that expresses your appreciation. 5/8 – National Train Day started in 2008 to share the history of trains and the advantages of railway travel. Check out one (or more) of our train-themed crafts for kids. 5/12* – Mother’s Day honors mothers, motherhood, maternal bonds, and the influence of mothers in society. Spoil Mom with a card, gift, or special meal that shows just how much you love and appreciate her. 5/12 – Kite Day is such a fun way for families to spend time together. Create your own kite, then head outdoors to watch it fly! 5/19 – Circus Day honors the anniversary of the first Ringling Brothers performance. Craft up some clowns, pop some popcorn, then act as ringmaster at your own circus puppet show. 5/21* – International Dinosaur Day is the third Tuesday in May. Fossils of the “terrible lizard” have been found on all 7 continents. Celebrate with dinosaur crafts and homemade snacks. 5/27* – Memorial Day, observed on the last Monday of May, honors those who died while serving in the U.S. military. It started following the Civil War and was originally known as Decoration Day. Memorial Day became an official federal holiday in 1971. Great Outdoors Month is celebrated all month long in June! Get outside with the kids to enjoy outdoor games, activities and sports. Go fishing, go on a hike, have a scavenger hunt. Be sure to check out all the activities and ideas we’ve collected. Zoo and Aquarium Month is a nationally recognized celebration all month long that encourages people to visit and appreciate their local zoos and aquariums. We have collected so many zoo and aquarium crafts it will be tough to decide what to make! National Camping Month is recognized during the entire month of June. Thousands of families enjoy camping in the great outdoors! There are lots of kid’s crafts and recipes with a camping theme. National Fishing Week is recognized during the first week of June. We’ve put together a large collection of fish and fishing crafts, activities and fun recipes to help you celebrate. National Clay Week is the second week in June, but there’s also some celebrating going on during October! No matter which week it actually is, we’ve found hundreds of clay and dough projects to have fun with. 6/1 – National Donut Day was first created by the Salvation Army before World War II! These days donut shops all over the country give away free donuts on June 1st. We think donuts are fun and cute so we’ve collected a bunch of recipes and crafts to celebrate! 6/8 – World Oceans Day falls on June 8th every year and aims to bring awareness to the oceans of the world, including cleaning them up and preventing pollution. Teach kids about the importance of our world’s oceans through crafts, recipes, games and activities. 6/12 – Magic Day seems to be celebrated several times per day, perhaps because almost anyone can proclaim a special day with the Internet! We are happy to share of magic crafts and ideas with your kids in June as well as October! 6/14 – Flag Day is celebrated on June 14th commemorating the adoption of the U.S flag which happened on June 14, 1777. Flag Day is not a celebration of the flags of the world, which is a common misconception. 6/15 – Fly A Kite Day is another one of those days that doesn’t seem to really have an official date. Some say June 15th, but we’ve also seen stories about fly a kite day in February and April! Regardless, flying a kite is fun for kids, so even if the day is not official, let’s celebrate it anyway! 6/16* – Father’s Day changes each year as it falls on the third Sunday of the month. Kids can make a homemade Father’s Day card or gift, make cupcakes, or create a gazillion different projects! 6/18 – International Picnic Day is every June 18th and encourages people to get outside and enjoy a meal together! Picnics are fun and often include playing outdoor games. Check out all our picnic crafts and recipes. 6/21* – First Day of Summer, the summer solstice, varies between June 20 and June 22 every year, depending on the year and the time zone. You won’t even believe how many summer crafts and recipes we have collected for you! 6/23 – National Pink Day is another one of those made-up holidays, but it’s fun to celebrate a color for a change! Make crafts and treats in the color pink. National Picnic Month takes place in July. With the warm temperatures and plenty of daylight, it’s the perfect time to picnic with family and friends. National Hot Dog Month celebrates one America’s favorite foods. Because the hot dog is such an important part of US culture, Hot Dog Month is occurs during the same month as Independence Day. We have plenty of hot dog crafts, both edible and not! National Ice Cream Month was officially recognized in 1984, when President Ronald Reagan designated July as National Ice Cream Month. He also named the third Sunday of the month as National Ice Cream Day, so you have plenty of opportunities to craft with and enjoy this frozen treat. 7/1 – Canada Day celebrates all things Canadian! On July 1 in 1867, the Constitution Act unified three colonies into the single entity of Canada. 7/2 – World UFO Day is time for people to gather together and watch the skies for unidentified flying objects. It’s also time to gather together and create your own UFO craft! 7/4 – Independence Day commemorates the adoption of the Declaration of Independence in 1776. Celebrate with patriotic crafts, foods, and games. We have hundreds of ideas for you! 7/7 – Macaroni Day is July 7. There are lots of ways to enjoy this beloved pasta: hot and gooey with cheese, cold in a delicious salad, or dry and on the craft table! 7/12 – Paper Bag Day honors a humble invention that we use in our daily lives. The American inventor, Francis Wolle, patented the first paper bag machine in 1852. Make a paper bag puppet or other craft in his honor. 7/14 – Barn Day honors the structure that houses animals, equipment, grain, and hay. Visit a barn and then create a barn-themed craft. 7/14 – Bastille Day is the national day of France that marks the storming of the Bastille, a turning point in the French Revolution. Celebrate la Fête nationale with French foods, crafts, and games. 7/20 – Moon Day recognizes the anniversary of the first human to walk on the moon. Honor this accomplishment with a moon craft or experiment. International Clown Week takes place the first week of August. It officially in 1971 began as National Clown Week and has expanded across the globe. Celebrate with clown crafts and fun! National Apple Week is the second week in August. It welcomes the late summer harvest and celebrates apples as a symbol of back-to-school preparations. 8/3 – National Watermelon Day is all about one of our favorite summertime fruits. We’ve gathered dozens of watermelon crafts and recipes for you to try. 8/4* – Friendship Day is the first Sunday in August. It was started by Hallmark in 1919. Celebrate by crafting with a friend! 8/10 – S’mores Day is all about that ooey-gooey treat we all love. Make a s’mores craft, then follow it up with one of our recipes. 8/10 – Snoopy’s Birthday. Show some love for that beloved beagle on his birthday! He first appeared in comics way back in 1950. 8/11 – Play in the Sand Day is a great time for crafting! We have lots of beach crafts and other projects using sand that you’ll love. 8/19 – National Aviation Day was established by FDR in 1939. August 19 was chosen because it was Orville Wright’s birthday. Mr. Wright was alive to celebrate the first nine National Aviation Days. 8/24 – Strange Music Day was created by a musician named Patrick Grant to encourage people to listen to unfamiliar or bizarre music. Broaden your musical spectrum while you craft the day away! 8/26 – National Dog Day is all about man’s best friend. Try one of our many dog-themed crafts and recipes. 8/30 – Frankenstein Day doesn’t seem like it should take place in August, but the date marks the birthday of author Mary Shelley, who wrote Frankenstein in 1818. Whether you choose to do your Frankenstein crafting now or in October, we have lots of fun craft and recipe ideas you’ll love. National Chicken Month takes place in September. While its goal is to promote eating chicken, you can certainly celebrate with crafts that look like chickens but aren’t actually made from them! National Honey Month occurs each September to promote beekeeping and to share the benefits of honey as a natural sweetener. National Rice Month, celebrated in September, honors that small but mighty grain that is so popular. Rice is great for eating, but it is also a popular craft material. Browse through all of our rice crafts to learn more. National Sewing Month began in 1982 by presidential proclamation “in recognition of the importance of home sewing to our nation.” Learn to sew or sharpen your skills using one of our many craft tutorials that involve sewing by hand or machine. National Farm Animals Awareness Week is the third week in September. Honor these useful and beloved animals with a craft or recipe inspired by cows, pigs, sheep, and others. National Flower Week, also the third week in September, celebrates the bountiful beauty of nature. Try a flower-themed craft or recipe, or head outside and plant flowers together as a family. National Dog Week has been celebrated the 4th week of September since 1928. If you love canines, join in the fun with one of our many dog-themed crafts and recipes for kids of all ages. 9/2* – Labor Day became a federal holiday in 1894 and is celebrated on the first Monday in September. It honors the American labor movement as well as contributions workers have made to the country. 9/8* – Grandparents Day is celebrated in many parts of the world. It falls on the first Sunday after Labor Day in the US. Make a special craft for (or with!) your grandparents. 9/9 – Teddy Bear Day recognizes those cuddly bears that comfort so many children. Check out our ideas for teddy bear crafts, teddy bear recipes, and even teddy bear picnics! 9/11 – Patriot Day marks the anniversary of the September 11 attacks and honors the memory of those killed. 9/13 – National Peanut Day celebrates the beloved food that is frequently mistaken for a nut. Peanuts are legumes and are an excellent source of protein, antioxidants, and many vitamins and minerals. Try a peanut craft or recipe on September 13. 9/15 – Make A Hat Day is, obviously, a great occasion to make a hat! Lucky for you, we have dozens of kid-friendly options. 9/15 – National Mushroom Day is a celebration of the many species of fleshy fungi. Try one of our mushroom crafts or recipes today. 9/16 – Collect Rocks Day. Kids are natural collectors, so this is a holiday they’ll be thrilled to celebrate. After collecting rocks, check out the many craft possibilities involving rocks. 9/16 – Mayflower Day remembers the 102 people who set sail from Plymouth, England to the New World. They were in search of freedom and opportunities. 9/16 – National Play-Doh Day celebrates the classic toy that was originally sold as a wallpaper cleaner! Play-Doh has been a part of childhood since 1956 and was inducted into the Toy Hall of Fame in 1998. 9/19 – Talk Like a Pirate Day has been around since 1995. Join in the fun, all ye bilge rats, and shout out ‘Ahoy Matie!’ and ‘Aye, Aye Capt’n’ all day long. Try some pirate crafts, too! 9/22 – Elephant Appreciation Day started in 1996 to honor this beloved and intelligent mammal. Elephants live 60-70 years, develop close family bonds, love to play in water, and will eat almost any type of plant. 9/22* – The First Day of Autumn happens at a precise moment each September (either the 21st, 22nd, or 23rd) when the sun is directly over the equator. It’s time to start crafting with acorns and fallen leaves, pumpkins and apples, corn and scarecrows, and all the other symbols of autumn! 9/23 – Checkers Day has nothing to do with the game, but instead marks Richard Nixon’s famous ‘checkers’ speech that introduced the nation to Checkers the cocker spaniel. Still, there’s no reason not to pull out the checkerboard today! 9/29* – Rosh Hashanah, which translates to “head of the year,” is the Jewish New Year. It is a time for rejoicing and introspection, special foods, and connecting with family. Breast Cancer Awareness Month takes place each October. This annual international health campaign is organized by major breast cancer charities to increase awareness and to raise funds for research into the cause, prevention, diagnosis, treatment, and cure of breast cancer. National Apple Month started in 1904 as National Apple Week and has expanded to the whole month of October. Celebrate with one (or more!) of our many apple-themed crafts and recipes for kids. National Clock Month is a great time to think about the impact that clocks have on our daily lives. Make a clock craft or recipe as a family sometime during October. National Dessert Month takes place each October, not that anyone needs an excuse for dessert! Whip up an edible craft or two this month with the kids. National Pizza Month was first observed during October of 1984, but any time is a great time for pizza. It’s a fun party theme, too! National Popcorn Popping Month happens each October when it is time to harvest this delicious and healthy snack. Celebrate with a popcorn craft or recipe. International Dinosaur Month is best celebrated by learning about these fascinating prehistoric animals. Enhance your learning with dinosaur crafts and hands-on activities throughout the month of October. Earth Science Week is the third week in October. Get outdoors and explore the planet through nature crafts that kids love. 10/3 – Look at the Leaves Day is a great time to start a new tradition. Go on a family nature walk to admire the gorgeous colors of the trees around you, then collect fallen leaves to bring home for crafts. 10/5 – World Teacher Day was started in 1994 to mark the anniversary of the adoption of the 1966 ILO/UNESCO Recommendation regarding the rights and responsibilities of teachers. This isn’t the same as Teacher Appreciation Day, but any teacher would love a thoughtful, handmade gift to mark the occasion. 10/6* – World Card Making Day hasn’t been around for long, but it’s getting bigger each year. Join the celebration by making (and sending!) handmade cards. 10/8* – Yom Kippur, which is also known as the Day of Atonement, is the holiest day of the Jewish year. It is about atonement and repentance. 10/8* – Columbus Day marks the anniversary of the arrival of Christopher Columbus in the Americas on October 12, 1492. The official date fluctuates; it is always celebrated on the 2nd Monday in October. 10/8* – Thanksgiving Day in Canada occurs on the second Monday in October. It celebrates the harvest and other blessings of the past year. 10/12 – Farmer’s Day dates back to the 1800’s. It pays tribute to all of the hard-working farmers throughout American history. 10/17* – Fossil Day celebrates paleontology and the importance of preserving fossils for future generations to see. Make a fossil craft today! 10/20* – Sweetest Day is a regional holiday celebrated in the midwestern US. Like Valentine’s Day, it’s a time to give candy and cards to loved ones. 10/20 – International Archeology Day is the 3rd Saturday in October and concludes Earth Science Week. Many museums, historic sites, and universities hold public digs, lectures, or demonstrations to celebrate. 10/30 – National Candy Corn Day is a fun time to enjoy all aspects of this quintessential fall treat. Craft up some candy corn projects while munching on candy corn! 10/31 – Halloween is one of the top holidays for crafting! Whether you’re looking for costume ideas, edible treats, or home decor, we have hundreds of Halloween ideas you’ll love. National Aviation Month is dedicated to recognizing America’s contributions and achievements in the development of aviation. Celebrate with an airplane craft! Peanut Butter Lover’s Month happens each November, marking the anniversary of the first patent issued for peanut butter in 1895. Whip up an edible craft featuring peanut butter. We have plenty of ideas for you to try. 11/5 – National Donut Day happens twice a year, which is fine by us! Celebrate in June and again November with donut-themed crafts and recipes that kids (and adults) will love. 11/6 – National Basketball Day is the perfect time to make basketball-themed crafts and recipes with kids. Follow it up with a friendly game of hoops! 11/5* – United States Election Day is set by law for general elections of federal public officials. It is set as “the Tuesday next after the first Monday in the month of November” or “the first Tuesday after November 1”. Election Day can fall from November 2 to November 8. 11/7 – Hug-a-Bear Day celebrates all those beloved teddy bears out there! Grab your bear and try some teddy bear crafts and recipes to celebrate. 11/10 – Sesame Street Day was started in 2009 to mark the fortieth anniversary of this tremendously influential and important TV program. Generations have grown up with Sesame Street and fallen in love with Bert and Ernie, Oscar, Big Bird, Cookie Monster, Grover, and the rest of the gang. 11/11- Veterans Day honors military veterans and their service to their country. Originally called Armistice Day, it marked the end of World War I at the 11th hour of the 11th day of the 11th month of 1918, when the Armistice with Germany went into effect. It was renamed Veterans Day in 1954. 11/15 – America Recycles Day is a national initiative by Keep America Beautiful. Do your part by committing to recycle and keep our country clean. 11/16 – Button Day was founded in 1938 by the National Button Society. The goal was to recognize and celebrate button collecting as an organized hobby. Try some button games and crafts today! 11/17 – Take A Hike Day is the perfect chance to get outdoors and enjoy nature! Try a scavenger hunt or nature craft to make the day even more fun. 11/28* – Thanksgiving began as a day of giving thanks for the harvest and for the blessings of the preceding year. Many celebrate with families and enjoy traditional foods while giving thanks. 12/1*- Advent, from the Latin meaning “coming,” marks the season of expectant waiting and preparation for Christians. It starts four Sundays before Christmas and is celebrated with wreaths, candles, countdown calendars, and special prayers. 12/7 – National Cotton Candy Day celebrates the delightful confection that dates all the way back to the 1400’s. It was first first called spun sugar. 12/8 – National Brownie Day is the perfect time to enjoy the delicious treat that was invented in the late 1800’s in Chicago. The cross between a cookie and a cake has been popular ever since! 12/12 – Poinsettia Day honors Joel Roberts Poinsett, the botanist, physician and Minister to Mexico who introduced the flower to the US in 1828, as well as John Ecke, Jr. who developed the technique causing seedlings to branch. More than 34 million poinsettias are sold in the US each year! 12/13 – National Cocoa Day is in December, but this delicious beverage is wonderful any time you want to warm up. Pair it with a fun cocoa-themed craft on a cold winter’s day. 12/20 – Games Day is the perfect time to break out your favorite card games, board games, and dice games to enjoy with the family. Even better? Make up your own game! 12/21 – First Day of Winter is the shortest day of the year (meaning, it has the fewest hours of sunlight). In the Northern Hemisphere, it occurs on December 21 or 22. Light some candles or turn on the lights to keep crafting after sunset! 12/22* – Hanukkah (also known as the Festival of Lights) is a Jewish festival that lasts for eight days and nights. Jews celebrate by lighting the candles of a menorah, playing dreidel, and eating oil-based foods. 12/25 – Christmas is a holiday marking the birth of Jesus Christ. Christmas is celebrated religiously by many Christians as well as culturally by non-Christians around the world. Christmas begins on December 25 and lasts 12 days. 12/26 – Kwanzaa is a weeklong celebration honoring African heritage in African-American culture. First celebrated in 1966, Kwanzaa focuses on seven core principles and culminates in a feast and gift-giving. 12/27 – Visit the Zoo Day is, obviously, a great day to visit the zoo! Or, stay home and fill your day with dozens of animal-themed crafts and save the zoo visit for a day that will be less crowded. 12/31 – New Year’s Eve is even more special with crafts and activities to welcome the new year. Stay up late trying some of our many New Year’s crafts and recipes! Dates marked with an asterisk (*) vary by year. All dates listed above are for 2019.